To him, no one is a stranger, except for people he hasn't met yet. He generally misses the point of things. He is seven degrees of separation from Kevin Bacon. He wouldn't miss a rerun of Everybody Loves Raymond. He is cautious about looking through a People Magazine in line at the supermarket for fear the cashier will yell at him if he doesn't buy it ..... and she usually does. He masturbates to pictures of women he could actually get. He thinks seer sucker will come back in. No, he thinks it never went out. When he doesn't understand the directions on his GPS, he is too embarrassed to run it again for fear it will think him stupid, and returns home. He has a rabbi who has tried desperately to convince him to become an atheist. He is fond of saying "everybody talks about the weather but nobody does anything about it" and then saying "And you can quote me on that!" His resume lists writing his resume as one of his major accomplishments. His dishwasher creates drops that spot. When he plays with his Tickle Me Elmo, he insists a third party be present. He never accepts second place, so he never enters anything that awards places. He would never ask a cashier for change without at least also buying a Mounds Bar or if there is no Mounds Bar, a large appliance. He watches Saturday Night Live, but hates himself for it. He looks forward to the Winter Olympics, for the curling. When he goes to a petting zoo, he won't pet a llama unless they've first been formally introduced. He leaves a half open book lying around he has never read to try to impress people. It is Fifty Shades of Gray. See the two hot women above? Photo shopped in. "I don't always drink beer, because it makes me nauseous and I wake up with a headache. 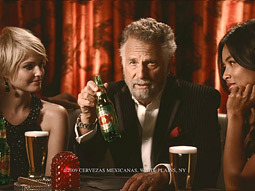 Dos Equis? No f*cking way! I cannot even spell it! "Now I think I'm going to take me a nap .... and then go out for a walk, or maybe not.... and then kind of sit around or something or other ... "
And for all the real Dos Equis commercials, click here. Remember to always use alcohol responsibly, my friends! I think I'll just put on my smoking jacket and peruse the cardboard cut-outs of cheerleaders hawking light beer in the parlor. He has tried to talk his smoking jacket out of cigarettes because it if dies, he cannot afford another. 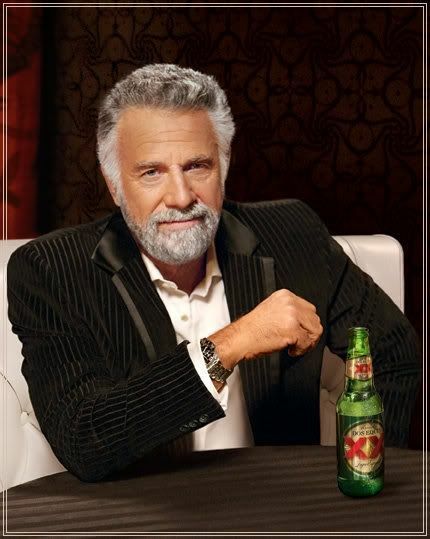 To him, you are the most interesting man in the world!